Fresh, beautiful and healthy lettuce: that’s Mary Ellen Taylor’s business. Taylor is the co-owner of Endless Summer Harvest, a hydroponic lettuce farm in Purcellville, Virginia. 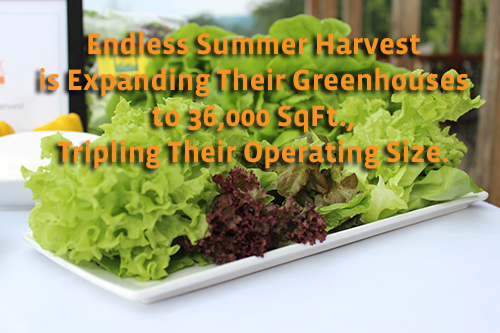 Endless Summer Harvest is able to produce a wide variety of lettuces and salad mixes year-round in their climate-controlled greenhouse, ensuring customer loyalty and a steady cash flow. By growing their lettuce hydroponically, ESH avoids many of the pitfalls inherent in farming, including damage from animals, wind, or rain. In fact, the lack of soil creates a product that Taylor calls “better than organic,” as it requires no pesticides and is completely immune to the pollutants typically found in the ground. Endless Summer Harvest’s fresh products became so popular, that in the summer of 2012, Taylor realized that she needed to expand. An active community member already, Taylor came to the Department of Economic Development to work on her plans to grow her business. Expediency in the Building and Development process was key, as Endless Summer Harvest was currently producing at maximum capacity on their farm. This expansion will result in a maximum build out of the current farm location. In addition to ushering Endless Summer Harvest through the permitting process, Economic Development was also able to facilitate on-site Health Department inspections.